My Child Has A Fever, Should I Be Afraid? Fever helps the body fight infection. Fever helps slow growth of bacteria and viruses. It also enhances the immune fighting cells in the blood. A high fever does not necessarily mean that there is a serious disease. Many viral illnesses can cause very high fevers. While these fevers might be high, they will go away without any help in three to five days. Fevers do not cause brain damage. Again, fever is a normal physiologic response. The only time that fever is dangerous is when it is from heat stroke or hyperthermia. Symptoms of heat stroke are red hot dry skin with no sweating and confusion. Infections and illnesses that cause fever do not cause heat stroke and are not dangerous. It is true that a small percent of children who get a fever will have a febrile seizure. Febrile seizures occur in about 4% of kids. They can be very scary to watch but they do not cause brain damage. Medicines to lower fever are not expected to bring the temperature down to normal. Ibuprophen and acetaminophen are often used to bring down fever in children. However, these medicines will only help the child feel better for a short time. When the medicine wears off, the fever will return. 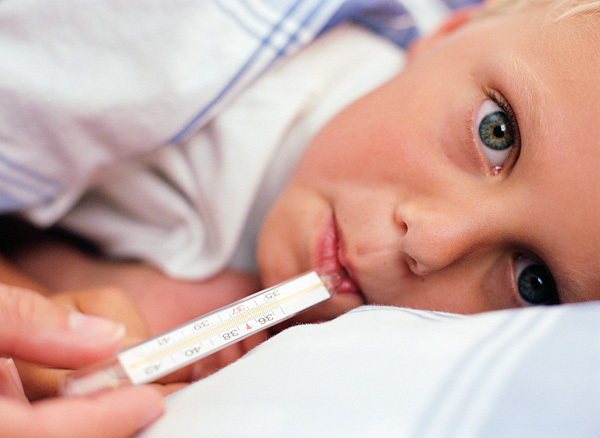 Your child will continue to have fever for as long as the illness lasts (usually 3-5 days). Also, these medicines will lower the fever but they are not expected to bring the temperature back to normal. It is expected and helpful to have some fever while your child is sick. Of course you want your child to be comfortable and you do not want your child to get dehydrated from a high fever but remember that the fever is helping your body fight infection. Also when your child is sick, he or she should be resting. If you bring the temperature back down to normal with medicine than he will want to run around a play. The goal in using medicine for fever control is to keep your child comfortable while his body is fighting the illness. Fevers will not continue to rise without treatment. The brain has a “set point” temperature that it will reach and then start to come down, even without medicine. Medicines to bring down fever will not prevent a febrile seizure. One in twenty five children will have a febrile seizure. It is impossible to predict and it is impossible to prevent. Remember that while they are scary, they are not dangerous. Do not use medicine to try and prevent a seizure. Medicine for fever should only be used to keep your child comfortable. It is most important to determine the cause of your child’s fever. Fever is just a symptom. If the fever is from strep throat or an ear infection then he might need antibiotics. If the fever is from a virus, then it will need to “run its course”. You should bring your child to the doctor to help determine the cause of the fever. Once you know the cause, you can relax. 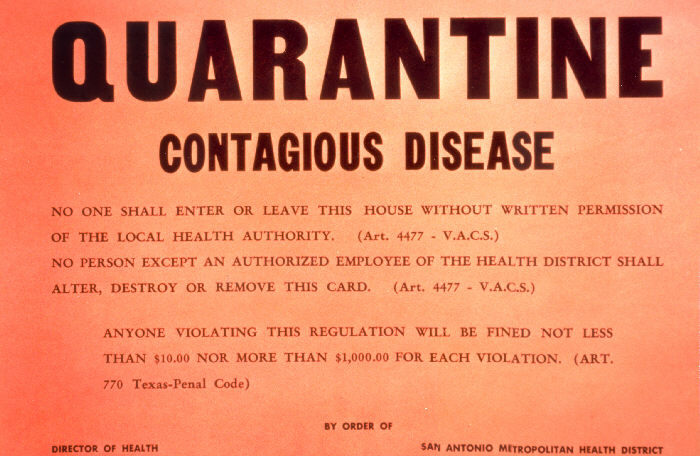 In the fall of 1957, the Asian influenza pandemic was spreading across the country. My younger sister had just been diagnosed with that flu, and my grandmother had arrived shortly thereafter to help at our home when my mother entered the hospital to give birth to another sister. In those days, one could count of a solid seven days in the maternity hospital, even for an uncomplicated delivery. Knowing the extremely contagious nature of the flu (she had lived through the devastating influenza pandemic of 1918), my grandmother set out with every weapon known to modern grandmotherhood to prevent my father and me from getting sick, fearing the consequences for my mother and newborn sister. With isolation, chicken soup and constant scrubbing and disinfecting, my father and I were spared the disease, as were my mother and sister, and, as long as she lived, my grandmother delighted in telling the story of how she confounded the pediatrician who had predicted that we would all very soon be ill. Flash forward fifty-four years to 2011. What are the risks to siblings today when one member of a family contracts a communicable disease, and how should we respond? I think that the answer depends on many factors, one of which concerns the nature of the particular illness that one person has contracted. Some viral illnesses are highly contagious, even without direct contact. Certainly chicken pox and measles used to spread through families like wildfires, but immunization has largely reduced the occurrence of these diseases, primarily by greatly reducing the amount of disease in circulation, and, further, by producing immunity in children who might somehow be exposed. The same goes for influenza, the bane of my grandmother; since universal influenza immunization was recommended a few years ago, the burden of disease has been reduced, although not as much as it could be if everyone actually did get their flu shots. How about other types of infectious, contagious illnesses? The common cold is just that, common, and most people will suffer one or multiple episodes each year. Unfortunately, there is no effective preventive immunization, and it does tend to spread readily; fortunately, it tends, in most people, to be relatively mild and of short duration. Strep throat is another common contagious illness, especially in children. There certainly are families where multiple members will get strep in close temporal relationship to each other, and these may be the result of spread within the family. But it is also possible that multiple family members were exposed at school or work, and contracted the illness elsewhere. But strep is harder to spread than some of the illnesses discussed previously, and there are many cases where one family member gets it, and no one else becomes sick. This is one illness where good handwashing, and avoidance of sharing of food, utensils and so on, can be a useful preventive measure. The same can be said for infectious mononucleosis–“mono,” also known as the “kissing disease,” primarily for its reputation as a common occurrence during adolescence. Yet in most of the families where one child has mono, it is very uncommon for other siblings to also contract it. Thus simply sharing a room, or time at the dinner table, is generally not enough to transmit an illness like mono. Pneumonia in children is also common, and the vast majority of cases are viral in origin–and they are often caused by the same viruses which cause the common cold. I tend to think of most cases of pneumonia as “a common infection in an uncommon place,” and generally feel that, while another member of a family might catch the same virus, it is far less likely to be caught as pneumonia. Rather, it might cause a head cold, sore throat or ear infection in someone else. Rare is the day which goes by that I am not asked a question like “his brother has strep (or pneumonia of the flu or…), so why can’t you just treat all my kids for it without having to see them?” In response, it is important to point out that every person who gets a fever after being in contact with someone who has strep is far from guaranteed to have strep as the cause of that fever; most illnesses are just not that contagious, and most fevers require individual evaluation regardless of the person’s exposure. The same thinking goes into my response to the schools who send home notices every time someone in a class is diagnosed with strep, ostensibly warning parents to be on the lookout for strep in their children. About the only thing these notices accomplish is the wasting of paper. When your child is ill, pay more attention to how he or she is acting, how sick he or she appears, and how well the illness is being handled by the child, than to what diseases he or she might have been exposed to. Discussing that information with your pediatrician will enable you to better decide what y our next course of action should be for evaluating the illness in that child. What constitutes a common cold? Children can have 7-10 colds in one season, particularly the first year they are in any sort of a daycare or school setting. Colds are most contagious in the first two days – usually accompanied by a clear runny nose. The change in color of the mucous to yellow or green after 5-7 days (in the absence of fever or headache) usually signifies the end of the cold and will be gone in 2-3 days. Green noses don’t automatically need antibiotics! Is it an allergy or a cold? Visit this link to read more on the diagnosis and treatment of allergy symptoms. For children under one use nasal saline, bulb syringe, elevating mattress (put rolled up towels underneath the head of the mattress) or allowing to sleep in car seat if they can breathe more easily this way. Use nasal saline drops, with suctioning only if there is a lot of loose mucous, before feeding and sleeping. A warm bath will help bring break up the mucous. For children 1-3, nasal saline washes may help (try Simply Saline or the NeilMed sinus rinse for children). A trial of Benadryl may be necessary to relieve congestion. (click here for dosage information.) It is especially helpful at night if cough is interrupting sleep. For older children (>4) with congeston try mint tea with 1 teaspoon of sugar or honey to soothe sore throats and help break up congestion. For difficulty breathing through nose at night try Breathe Right strips for children. (Dr. Nikki loves them!) For persistent nighttime cough try humidifier, elevation and possibly Benadryl. Other cough syrups that we have found help include Delsym and long acting single ingredient dextromethorphan preparations. “Just a spoonful of sugar….”- sucking on a lollipop or a teaspoon of honey has been shown to decrease sore throat as much as cough medicines. Tylenol or motrin is appropriate for fever or sore throat, but doesn’t work for cough. Fussiness, not eating well, pulling on ears, breathing quickly or pulling in at ribs when breathing. Green, yellow nasal discharge that is accompanied by fever, headache, sinus pressure or that persists more than 5-7 days. Drainage out of ear canals. A cold that persists longer than 2 weeks, or that after several days is suddenly accompanied by a fever. The phone call came in through the answering service around 7:00 pm. “She’s four years old, Dr. Hackell, and she has a fever of 102 since this afternoon. Should I rush her to the emergency room?” Aside from the fact that I was still in the office, seeing patients until 8 that evening, as we do routinely in our office, I began thinking about the difference between an emergency, an urgent matter, a worrisome problem and an ordinary medical illness or question. This is not a trivial distinction to make when one considers the reasons that parents seek health care for their children, and it has a great impact as well on the burden that society faces in providing, and paying for, health care. An emergency is a condition where there is an immediate threat to one’s life or limb, a situation where, in the absence of prompt medical attention, there is a risk of serious, permanent or even fatal injury resulting. Examples are many, and could include a heart attack, head trauma with loss of consciousness or skull damage, prolonged seizures or asthma with respiratory distress. An urgent matter is not so easily defined, but might be considered a medical condition which is not life-threatening but which requires medical care to avert progression to a more serious condition which could become life-threatening. One might think of pneumonia, less severe asthma attacks, hives, persistent vomiting, and other similar examples. A worrisome problem is something which is clearly an illness, which may be causing discomfort, and which could, in theory, represent the onset of a more serious matter, but which at the moment is clearly not affecting a patient’s ability to breathe or otherwise function and interact with others. This category might include fevers, coughs, pain in the extremities, pain on urination, headaches and so on. And finally at the bottom of the list are the ordinary medical issues, best exemplified by the itchy rash of poison ivy, pinkeye, allergies and cold symptoms. It is inarguable that conditions should be treated at the facility best able to care for the patient in an efficient and cost-effective manner. Care in emergency rooms is many times more expensive than the same care delivered in a physician’s office, and in cases other than true emergencies, as defined previously, equally effective. Consider the child with abdominal pain, fever, loss of appetite and vomiting. When that child is seen in a pediatrician’s office, especially the child’s “medical home” where she is known to the doctor and staff, she will be seen and carefully examined, maybe have a urine sample and blood count done, and observed for the signs that her illness might represent a true emergency such as appendicitis, in which case she would be admitted to the hospital for either more testing or for surgery. But more likely, the results of the evaluation will be normal or non-specific, and she will be felt to have a stomach virus or cramps, and be sent home with appropriate management instructions and an admonition to return or call if more worrisome symptoms develop. Contrast that with the same child taken to the ER. The hospital charges for ER use are high, as are those of the ER physician. In most ERs, the child is more likely to have a battery of blood tests done, as well as an expensive CT scan of the abdomen—again, seeking to determine the presence or absence of appendicitis. Even if the child turns out, in the end, to have a stomach virus, the costs incurred in getting to that diagnosis will be vastly higher than those for the child seen in her pediatrician’s office. In addition, the time expended in the ER is likely to stretch into hours; rare, indeed, is the office visit, even with a period of observation, which exceeds an hour in duration. While no reasonable pediatrician would attempt to manage a life-threatening condition in the office, we do see urgent conditions every single day. We take care of kids with asthma who come in wheezing, we see children who have had seizures from fever, we evaluate injuries which might break bones and we manage vomiting and dehydration—these “urgent” conditions are often able to be managed quickly, efficiently and effectively in the same offices where children get their routine examinations and immunizations. We insure that urgent matters are attended to promptly, compared to an ER where the asthmatic child might wait for hours until after the heart attack or multiple trauma patients are seen, especially on busy evenings. 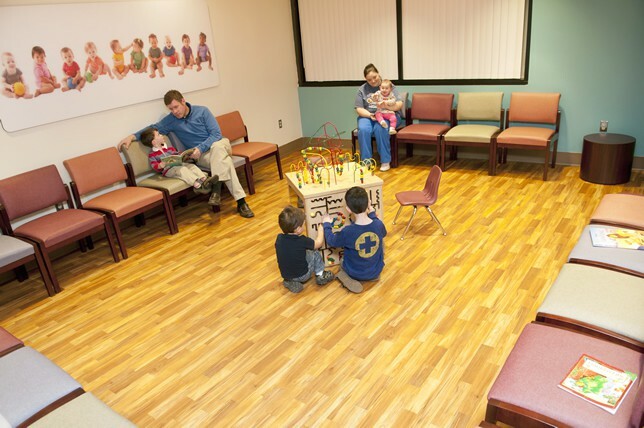 Pediatrician’s office are often a more friendly environment. Finally, the pediatrician’s office is a place known to the child, often more child-friendly than a large, noisy and busy emergency room, so the child is likely to avoid having an already scary situation be made even more frightening by the bustle of an unfamiliar place and unfamiliar faces. Worrisome conditions are those which do not need to be seen in an ER, either, especially at night. We all know how kids have a knack of getting sick at night, and on weekends and holidays. But it is important to decide whether the condition is a something that can and should wait until the next morning, to be seen in the child’s regular doctor’s office, as opposed to immediately running out to the nearest hospital, often giving everyone in the family from the child on up a long, miserable night in the ER. With more and more pediatricians adding evening and weekend hours, it is rarely the case that a sick child will need to wait much more than twelve or so hours before being seen and evaluated. Life-threatening emergencies should always go to the ER, and I would encourage parents to be over-cautious in determining what they might be worried about as an emergency. But at the same time, with a child with a simply worrisome condition, observing the child and thinking about how ill he or she appears is the first step to deciding whether or not to “rush” to the ER. A phone call to the pediatrician can also help a parent decide the degree of urgency represented by the child’s symptoms. Many times the child with a fever or an injury looks and acts good, and can be made comfortable at home until the doctor’s office opens in the morning. This actually will make the illness easier on the child, and enable him or her to be seen in the most familiar place, reducing the stress on all concerned. It will also generally be more cost-efficient. There is no doubt that the American health care system is in a financial crisis, given the large proportion of our national wealth consumed by health-care services. Pediatricians certainly do not advocate skimping on health care for financial reasons; in fact, the often-expensive preventive care which is our special interest may cost money upfront, but the payback over the years in dollars saved (and improved outcomes as well) is well documented. What we do seek to encourage is the most efficient and cost-effective use of health care dollars, in order that we, as a nation, can get the biggest bang for our buck. Making sure that our children get the level of care appropriate for the degree of their illnesses is just one step in that direction. Many Parents are Afraid of Fever. Don’t Be. In a recent article the American Academy of Pediatrics reviews the facts and fiction that surround fever in children and reminds nurses and pediatricians to better educate parents about fever. The following information does not apply to infants under three months of age for whom you should contact your pediatrician urgently for any temperature of 100.4oF (38oC) or higher. There is no “normal” temperature. 98.6 is an average and many children will normally run a little higher or a little lower. In addition, throughout the day, a given child’s temperature will vary by as much as a full degree. Fever can be helpful in fighting infections. Fever slows down the growth of viruses and bacteria while activating our immune system. Higher fever does not necessarily mean a more seriously ill child. Most fevers, no matter how high, are brief and not dangerous. However, if your child has a fever greater than 101 degrees Fahrenheit for more than 48 hours you should see the doctor to discover the cause of the fever. Fevers do not cause brain damage or death. Children with fevers above 104 degrees are not at increased risk of problems because of their temperature (the one exception is heat stroke, which usually occurs from over activity in warm weather.) Fevers can cause “febrile seizures” but these types of seizures, though scary to watch, do not cause any permanent effects. Furthermore, there is no evidence that Tylenol (acetaminophen) or Motrin (ibuprofen) use will reduce the risk of fever seizures. The #1 reason to bring down your child’s fever is to make him/her more comfortable. It is not necessary to wake your child to give him/her fever medicine. Look at your child, not the thermometer. If your child is drinking, quietly playing, or sleeping, do not worry about fever. If your child looks poorly and is too weak to drink, he/she should be seen by the doctor regardless of the temperature. Dr. Fierstein is a practicing pediatrician. Born in the Bronx and raised in Queens, Dr. Kerry Frommer Fierstein is a New Yorker all the way. She works atPediatric Health Associates, PC, a division of Allied Pediatrics of New York.